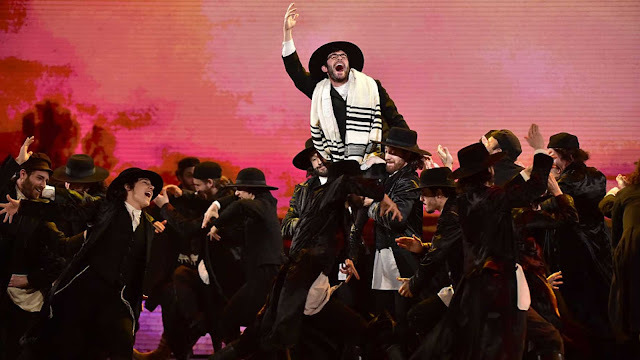 Home / News / Man Yells 'Heil Hitler' At Performance Of 'Fiddler On The Roof.' Audience Scatters. Man Yells 'Heil Hitler' At Performance Of 'Fiddler On The Roof.' Audience Scatters. On Wednesday night in Baltimore during the intermission of a performance of “Fiddler on the Roof,” a man stood up in the balcony, gave a Nazi salute and yelled “Heil Hitler! Heil Trump,” prompting members of the audience to run away, fearing an attack. Just prior to the intermission, at the end of Act 1 of Fiddler, a Russian policeman warns the protagonist, Tevye and the other villagers in the town of Anatevka that a pogrom targeting the Jews is imminent. Jablow added that uniformed police will guard the Hippodrome through Sunday, when the last performance of “Fiddler” is scheduled.